Adam reviews the new TNT Drama The Alienist starring Daniel Brühl, Dakota Fanning, and Luke Evans. The series is based on the Best Selling Novel by Caleb Carr. 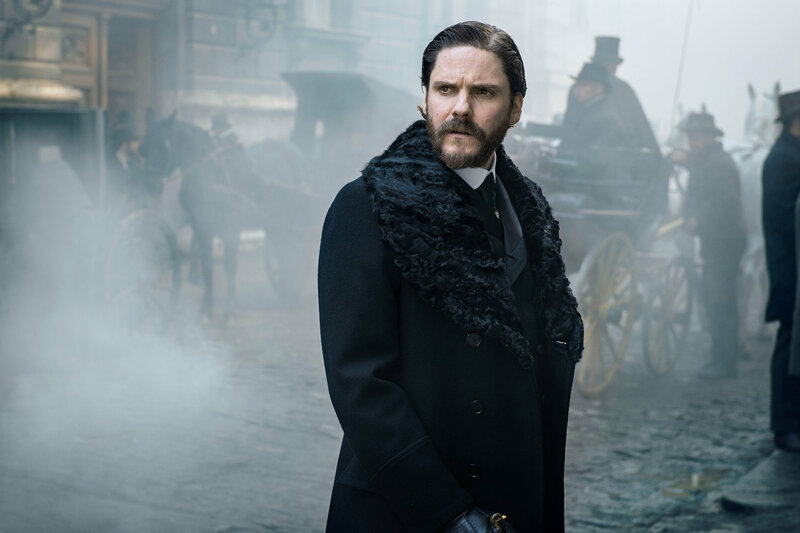 The series version of Caleb Carr’s beloved novel The Alienist appears to be in the best of hands with this particular iteration of the cast and behind the scenes crews. For well over two decades various producers, directors, and stars have attached themselves to Carr’s lavish, dark, thrilling novel in the hopes to bring it to the big or small screen. None, however, could crack its plot, vivid descriptions of murder scenes only to be counterpointed by equally lush descriptions of twelve-course meals, and the attention to the civil conventions that Carr managed to package into a page-turning beach read. Credited writers Hossein Amini and Cary Fukunaga have cracked that code in the translation to screen. The Alienist in short a mirror image of the novel; üdark, lavish, thrilling, and infinitely watchable. The first two episodes of the ten-episode limited series begin with setting up the world of The Alienist; turn of the century New York. Through these two episodes, we are introduced to our trifecta of main characters. John Moore (Luke Evans) a Newspaper sketch artist. Dr. Laszlo Kreizler (Daniel Brühl) the titular Alienist who’s treatments are on the cutting edge of psychological science at the time. Sarah Howard (Dakota Fanning) the first woman employee of the New York Police Department as secretary to the newly appointed Commissioner Theodore Roosevelt (Brian Geraghty). The series begins ominously as Dr. Kreizler dispatches Moore to a horrendous murder scene atop the, just being constructed, Brooklyn Bridge. The show never shies away from the brutality of the crimes but does not go into the sort of fantastical artistry of Hannibal or the gore-laden blood works of The Walking Dead. The series quickly shows Kreizler though brilliant has rubbed many the wrong way over the years. There is a history built into the show that feels novelistic. Amini and Fukunaga as writers never tip their hand. Everything is implied with off the cut dialog, glances, and interactions. As the story begins to unfold and Kreizler sees this as a series of murders what would be laborious and intricate in other shows feel natural and thrilling here. As great as the writing is the cast is beyond up to the task. Brühl as Kreizler though not a physical match inhabits the title character with the sort of arrogant charm and swagger that Brühl at his best is known for. A component of compassion is layered into the performance, something Brühl has not been allowed to show in his English language work thus far. Fanning and Evans are electric together as Howard and Moore. Fanning as Howard is contained rage and progress. There’s a passion to Fanning’s work here that does not normally seen from the actress. Howard is faced with indignities at every turn by truly horrendous awful men. Fanning plays it with the sort of brimming fire that we have not seen from her in other roles. Evans also a performer that has not been given his due finds a plum role as Moore. The work here like Fanning is exemplary inhabiting a man who is struck by grief and atrophy; leading him down a spiraling path. Though many shows have mined similar territory it’s The Alienist’s focus on the changing political, scientific, and sociological climate that pushes beyond other similar ventures. By smartly focusing on the inherent drama and strife held within that change in parallel with the investigation that Dr. Kreizler, Moore, and Howard find themselves in brings a prescient story that many will find compulsively watchable. If the other eight episodes of the series hold this quality 2018 has started off very strongly, even for Peak TV standards. The Alienist begins January 22nd on TNT.